Hi everyone! So it feels like I went MIA for a little while, what actually happened was I went on holiday for a little over a week and just wasn’t organised enough to have scheduled posts in advance! My holiday wasn’t anywhere fancy, my best friend’s husband was away for work and it was the first week of the spring break for her children so me, her and another friend took the kids away to a Haven in Ayrshire, what followed was a very tightly packed car journey across Scotland, a lot of swimming, and taking the kids to the evening shows and letting them play on the machines (my goddaughter and her brother are little gamblers in the making and had to win their tickets at the amusements!) The adults also drank a lot of gin and I finally watched The Greatest Showman! This past week has been trying to catch up at work, not the easiest when it was the start of a run of four day weeks, but I’m feeling a little more on top of things. I’ve caught up on sleep mainly and so I’m hoping this week will be time for me to get caught up on the blog! In blogging news I made the longlist for UKYABA’s Best Established Award which still shocks me, so thank you to whoever nominated me, it was certainly most unexpected! 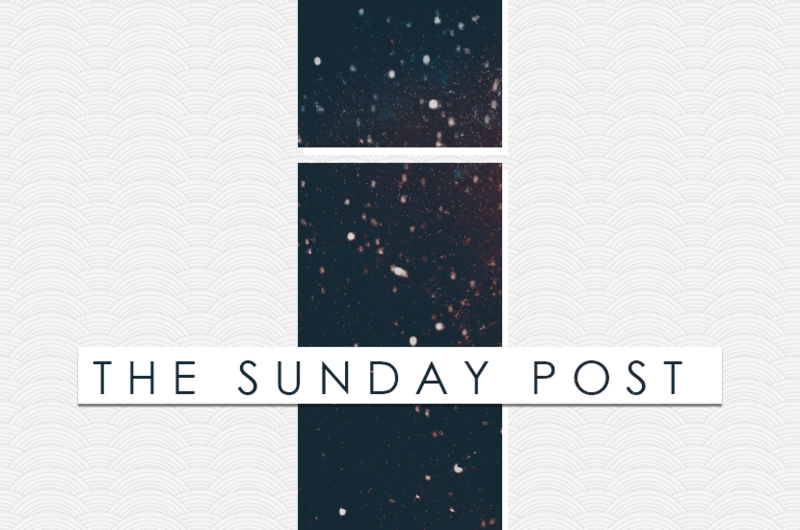 It’s a bumper collection this week to make up for a couple of weeks without a Sunday Post! The first Top Ten Tuesday I missed featured the things that would make you pick up a book – Check out posts by Tilly and Suzanne. The second was about the most outrageous things you’d done for the love of books – Tilly shared hers along with Kate, while Suzanne shared ten ways she fits a little more reading time into her day. Charlotte took part in the blog tour for Summer Bird Blue by Akemi Dawn Bowman and wrote a fantastic review. It’s made me really want to pick up the book! Jordyn shared a Bookstore Scavenger Hunt which sounds like so much fun! Kate shared her plans for an Easter Readathon which I’m hoping I may get to join in with assuming I can leave my work at work for the long weekend! Who knows! I still have my April release post to finish off so hopefully I’ll be sharing that with you! That was my week! Let me know your favourite blog post of the week, either one you’ve written or read somewhere else, and I’ll be sure to check it out! How was the Greatest Showman?! I have been wanting to watch it so badly. I really enjoyed it, admittedly I’d listened to the soundtrack a ridiculous amount of times beforehand actually seeing the visuals with the audio was amazing, the dancing was spectacular! That said there were definitely periods where I was frustrated with Barnum it’s definitely worth a watch! I listen to the music all the time as well. It is just so catchy! Glad to hear you liked the movie! I need to find a way to borrow it from someone or rent it. Glad you had a good time away! Thanks for the links! That scavenger hunt sounds amazing! You’re very welcome and it really does! Trying to decide how many weird looks I’ll get from people in Waterstones if I turn up to do it! I loved it I already knew I loved the songs but they gained an extra something seeing the visuals with them. Although Barnum was a bit of an arse at times and I wanted to shout at him! I am very much the unpopular opinion and am really not a fan! I did like some of the songs though, and I liked Zac Efron in it!